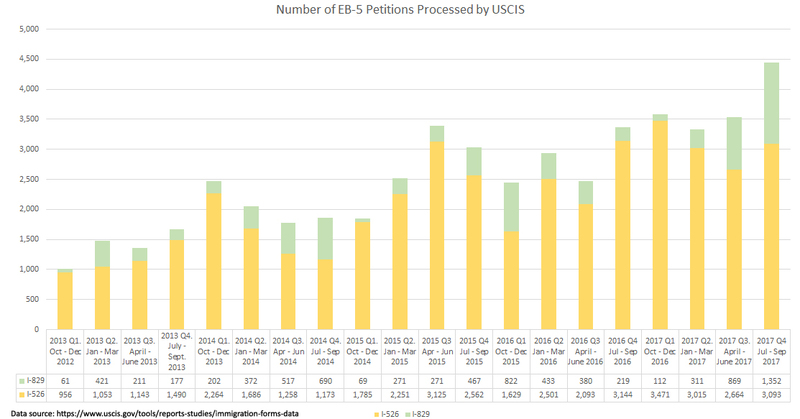 USCIS has updated the Immigration & Citizenship Data page with data for petitions processed in FY2019 Q1 (October to December 2018). 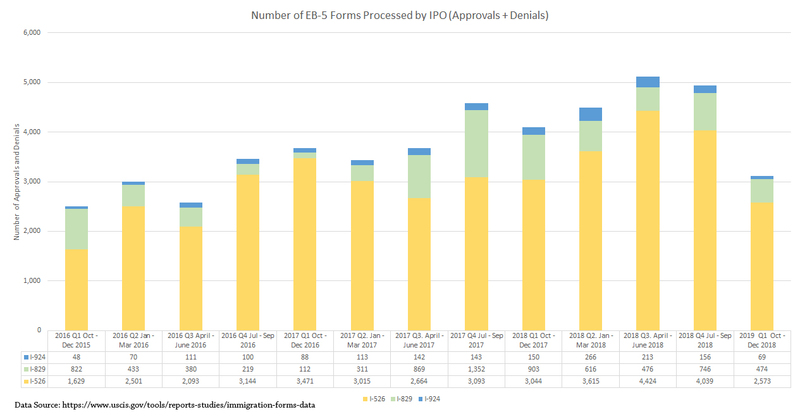 The data shows that the Investor Program Office had an unproductive first quarter, with the fewest EB-5 forms processed since 2016. No wonder processing times remain long. Sometimes the data reflects a workload trade-off (e.g. fewer I-526 but more I-829 processed), but FY19 Q1 just had very low output overall. What’s up, IPO? Are you losing staff? Burning time with extreme-vetting RFEs? I-526 and I-829 receipts were up from the previous quarter, but still relatively low. The All Forms report is interesting as a reminder of just how small EB-5 is in the grand scheme of employment-based petitions, and because the report now has separate line items for I-924 and I-924A. All regional centers that want to remain in good standing should file the I-924A annual report between October and December, yet the report shows only 322 I-924A receipts for Oct-Dec 2018. Did the rest of the 885 currently-approved regional centers decide that designation isn’t worthwhile anymore? Or does the report not capture actual I-924A submissions? Certainly I-924 filings remain very low. No surprise considering the high form fee, the difficulty of operating in the current environment, and the fact that exemplar approvals have no value if they come too late to be usable. There has been little activity on the USCIS regional center list since the beginning of the year. Additions to the USCIS Regional Center List, 12/31/18 to 04/19/19. U.S. Citizenship and Immigration Services (USCIS) invites you to participate in a public teleconference on Monday, Nov. 19, from 1 to 2 p.m. (Eastern) to discuss the Immigrant Investor Program, also known as the EB-5 program. This engagement is part of our ongoing efforts to enhance dialogue with the public on the EB-5 program. During the first part of this engagement, we will provide EB-5 program updates. The second part will be a question-and-answer session. We encourage the public to provide questions and comments on the EB-5 program in advance. We recommend calling in 10 to 15 minutes before the teleconference begins. Request a disability accommodation to participate. IPO processed a few more forms in FY18 Q2 than ever before. It’s nice to see processing trend in a positive direction, and a new record set. Once could wish for more dramatic improvement. The chart of quarterly processing volume over the past three years shows a very gradual upward trend. I-526 and I-924 volume (approvals+denials) improved significantly in Q2, but net improvement remained low when considering reduced I-829 volume. Form receipts at IPO reflect a gradual downward trend, driven by falling I-526 receipts. However I-526 receipts remain unsustainably high. The 10,000 annual quota of EB-5 visas means that the program can accommodate about 830 I-526 per quarter on average (assuming about 3 visas per investor). FY18 Q2’s unusually low 1,607 I-526 receipts is still almost twice the sustainable average: one quarter’s filings sufficient to claim half a year of visas. Form I-924 receipts and processing were both significantly elevated in FY18 Q2. No wonder I-924 processing times look better than expected. I-924 denial rates remain high. I-829 receipts grew in FY18 Q2, even as processing volume fell again, with fewer I-829 processed in Q2 than in any of the previous three quarters. 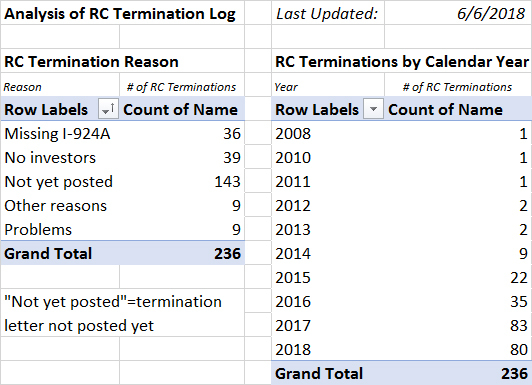 If we could predict processing times by dividing number of pending forms in Q2 by number forms processed in Q2, then I-526 would take 17 months, I-829 36 months, and I-924 16 months. This prediction differs from the month ranges currently in the USCIS Processing Times Report: 20-26 months for I-526, 30.5-39.5 months for I-829, 19.5-25.5 months for I-924. I tried several equations with the pending and volume numbers, and (unlike last quarter) didn’t find one that neatly replicates the USCIS processing time calculation. In case I-829 petitioners didn’t have enough to worry about already, the I-829 data doesn’t look right. The FY18 Q2 report reviews Q1 data, as follows: 694 receipts, 6,251 pending. But the Q1 report published in May had quite different numbers for Q1: 1,046 receipts, 6,673 pending. To where did those 352 receipts and 422 pending petitions from Q1 disappear? Or maybe they didn’t disappear, but joined other petitions of unknown origin, since the number of petitions reported pending at the end of Q2 (7,447), is higher by almost a thousand than what one would expect from taking Q1 pending petitions plus Q2 receipts minus Q2 approvals and denials. Hope USCIS can soon modernize beyond paper and counting sticks for keeping EB-5 records. Or am I missing something? For anyone who has had problems with USCIS case processing and thought of contacting the Ombudsman for help, pages 3-5 of the report gives a nice explanation of how the Ombudsman handles inquiries. And I appreciated the detailed discussion of background checks on pages 28-32 and 57-58. IIUSA has included helpful analysis of challenges to investment structures and terms in its letter from IIUSA to USCIS regarding Major Issues Facing the EB-5 Industry. My notes for an ILW call on 4/17 to discuss the “invest” requirement, and new USCIS challenges to equity with debt-like features. The notes link to the relevant decisions and cases, and summarize the fact pattern and arguments for each case. Suzanne Lazicki will be at the 2018 EB-5 Investors Conference in Los Angeles next week. I’ll be speaking on a panel at 1 pm on July 23 (“The Right Fit – How Current and Future EB-5 Projects are Changing with the Market”), and available to meet in-person on July 23 and 24. Look for me to chat, or use this calendar to fix a time. In a new Policy Memorandum dated July 13, 2018, USCIS Updates Policy Guidance for Certain Requests for Evidence and Notices of Intent to Deny. The memo, which will become effective on September 11, 2018, “provides guidance to USCIS adjudicators regarding their discretion to deny an application, petition, or request without first issuing a Request for Evidence (RFE) or Notice of Intent to Deny (NOID) when required initial evidence was not submitted or the evidence of record fails to establish eligibility.” This isn’t a major change, and not exclusive to EB-5, but a good reminder. Petitioners need to establish eligibility at the time of filing, and may not be able to depend on correcting major omissions in response to RFE. 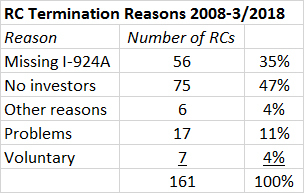 To date, USCIS has terminated 244 regional centers, mostly for inactivity, or for not filing the I-924A annual report. A handful have been terminated in connection with problems, including, last week, Vermont Agency of Commerce and Community Development. I’m particularly interested in the Vermont RC case, because it’s hard to imagine anyone doing more than Vermont has done to try to compensate for and recover from the oversights that allowed project fraud to occur under its watch. Vermont’s response to the Notice of Intent to Terminate challenged USCIS to be more precise about a regional center’s responsibilities for monitoring and oversight, and pointed out all the positive and responsible things the RC has done — including a plan to wind down the RC in an orderly manner that protects existing investors and prevents future problems. In response, USCIS makes that responsible plan a major plank in the denial decision: no future projects means failure to actively promote economic growth. Vermont plans to appeal. For more detail, see this VTDigger article, which ends with a link to the full USCIS termination notice. Additions to the USCIS Regional Center List, 06/05/2018 to 7/16/2018. The Administrative Appeals Office continues to issue non-precedent decisions on appeals of denied EB-5 petitions and applications. The cases give insight into recent USCIS thinking on sensitive topics: material change, deference to prior approvals, regional center oversight responsibilities, regional center activity requirements, bridge financing, and evidentiary requirements. When USCIS determined that funds were not at risk in the JCE, it erroneously identified the JCE as the project DBA, which is just a name, not an entity. AAO agreed that the applicant overcame USCIS concerns about working capital as an input to the economic model, and inflation affecting the revenue estimate. These cases reflect inconsistencies in EB-5 adjudications. USCIS denied exemplar I-526 amendment requests after having already approved eight investor I-526 petitions with the same project and documents (not to mention having reviewed the project in context of an initial regional center approval). Apparently, deference in EB-5 only goes one way: from exemplar to I-526, not the reverse. We wish that an approved actual I-526 petition could serve as de facto exemplar for future petitions involving the same project, but apparently it does not. APR242018_01B7203 (Matter of H-T-B-) concerns a regional center investor petition that was denied based on problems with the business plan: specifically, failure to link the plan to reality. USCIS doubted the project’s job creation potential because the plan was not grounded in evidence such as supply contracts, lease agreements, construction bids, permits, loan agreements, or analysis of competitors. Lacking such evidence, the plan was not considered comprehensive, credible, or “any more reliable than hopeful speculation.” This is why the business plans I write bristle with footnotes citing verifiable sources. With midterm elections approaching, some of our Congressional representatives find it expedient to talk about immigration. The discussion still centers on border security and undocumented children, while wealthy job-creating immigrants don’t fit either party’s talking points. Even if Congress manages some immigration legislation this summer, I’ll be astonished if it includes or affects EB-5. But I keep reading the news, just in case. I’ve moved my Washington Updates page to a main page (new link), and continue to update it as I hear or read things related to potential EB-5 program changes through legislation or regulations. Most recently, I linked to a Bloomberg NA article “Immigrant Investor Program in Limbo as Regulations Stall,” a podcast with EB-5 lobbyists discussing prospects for EB-5 legislation, and notes from Kathy Nuebel Kovarik (USCIS Office of Policy and Strategy) explaining what she thinks needs to be changed in EB-5. The USCIS Policy Manual has a new section: Volume 7: Adjustment of Status, Part A, Adjustment of Status Policies and Procedures, Chapter 7, Child Status Protection Act (Final date for comments: June 6, 2018). My expertise doesn’t extend to CSPA or status adjustment, but I hear that this doesn’t introduce changes, just moving existing policy into the Policy Manual. The USCIS FOIA reading room posted USCIS’s response to the 2017 Ombudsman Report to Congress. I don’t really recommend that you read it: the response mentions EB-5, but says nothing new or substantial. 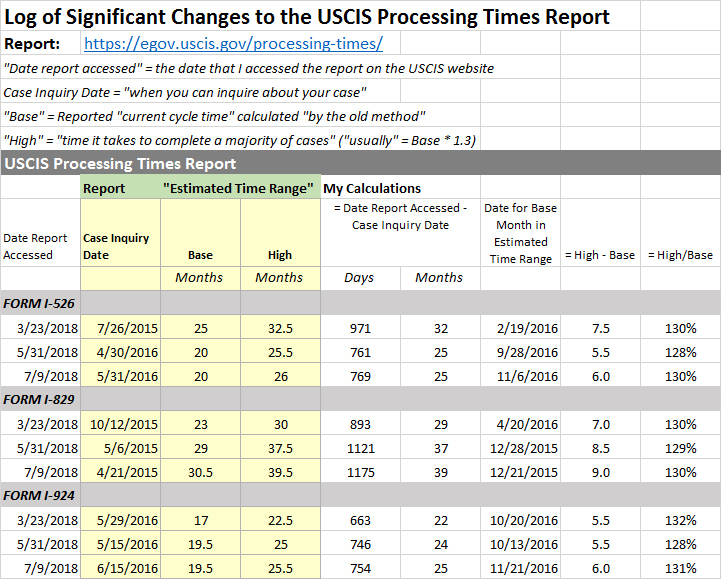 I did add the processing times excuses from this report to my on-going log of USCIS communications on processing times. The SEC continues to crack down on unregistered brokers (ahem, immigration attorneys) who accept commissions for facilitating EB-5 investments. See Matter of Jason J. Lee (May 10, 2018) and Matter of Edwin Shaw LLC (March 5, 2018). USCIS automatically extends the conditional permanent resident status of an immigrant investor and certain dependents for 1 year upon receipt of a properly filed Form I-829. The receipt notice along with the immigrant’s permanent resident card provides documentation for travel, employment, or other situations in which evidence of conditional permanent resident status is required. Within 30 days of the expiration of the automatic 1-year extension, or after expiration, a conditional permanent resident with a pending Form I-829 may take his or her receipt notice to the nearest USCIS field office and receive documentation showing his or her status for travel, employment, or other purposes. In such a case, an officer confirms the immigrant’s status and provides the relevant documentation. USCIS continues to extend the conditional permanent resident status until the Form I-829 is adjudicated. An immigrant investor whose Form I-829 has been denied may seek review of the denial in removal proceedings. USCIS issues the immigrant a temporary Form I-551 until an order of removal becomes administratively final. An order of removal is administratively final if the decision is not appealed or, if appealed, when the appeal is dismissed by the Board of Immigration Appeals. 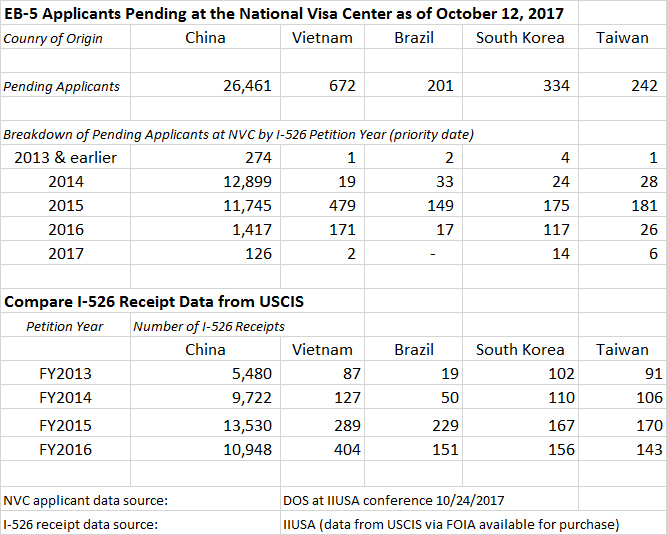 The USCIS Immigration Forms Data Page has posted EB-5 petition processing data for the 4th quarter of FY2017 (July to September 2017). The good news is that in FY2017, IPO finally – for the first time since FY2009 – adjudicated more EB-5 petitions than it received during the year. That’s what needs to happen for the backlog to shrink and processing times to fall. In FY2017, I-526 receipts were down 14% and I-526 adjudications up 31% from the previous year. I-829 receipts were down 24% and adjudications up 42% from the previous year. 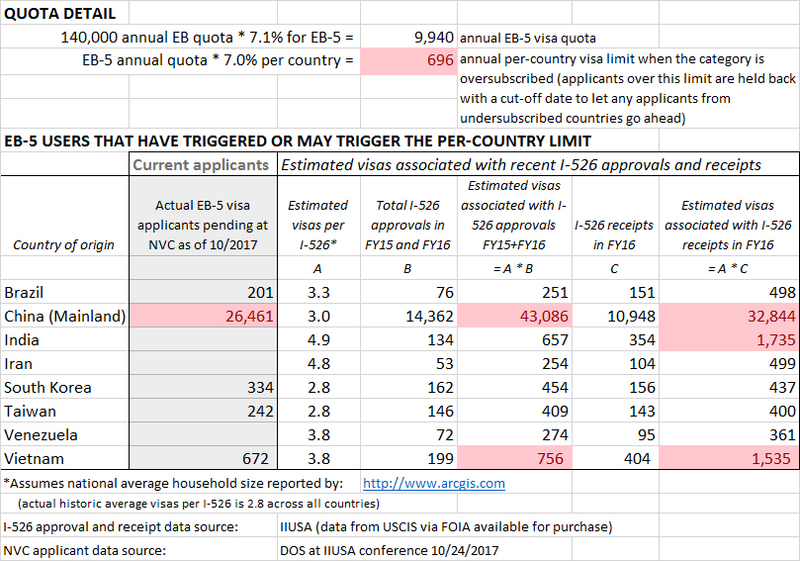 Although I-526 receipts fell slightly in FY2017, they were still unsustainably high – enough to claim nearly four years of visa numbers if the annual EB-5 visa cap stays at 10,000. As before, the quarterly receipt trend shows filing surges around regional center program sunset dates. I-829 receipts fell every quarter in FY2017, which is troubling. The State Department has issued the maximum number of EB-5 visas annually since FY2014, so I would expect a steady stream of petitions to remove conditions. Instead, it seems that an increasing number of people who received conditional permanent residence are failing to complete the EB-5 process. I-829 denial rates remain very low, however. 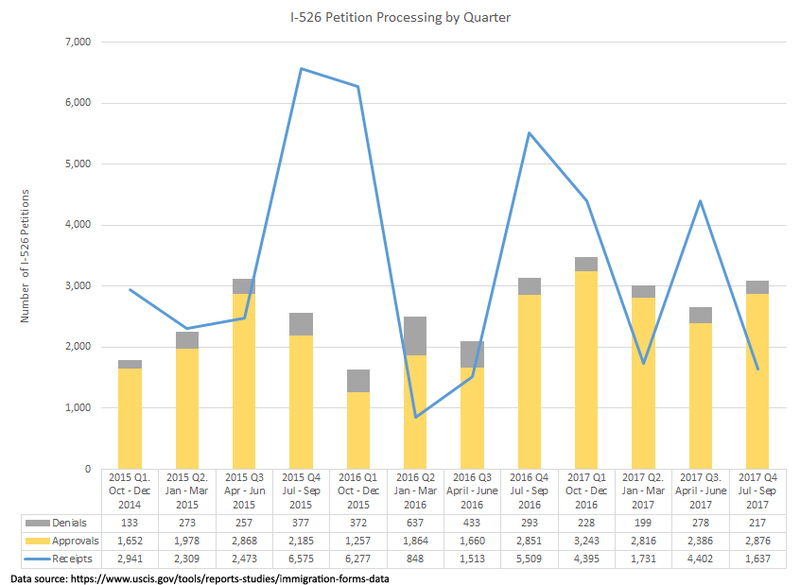 The most dramatic processing improvement in FY2017 came for I-829 petitions, particularly in the fourth quarter. 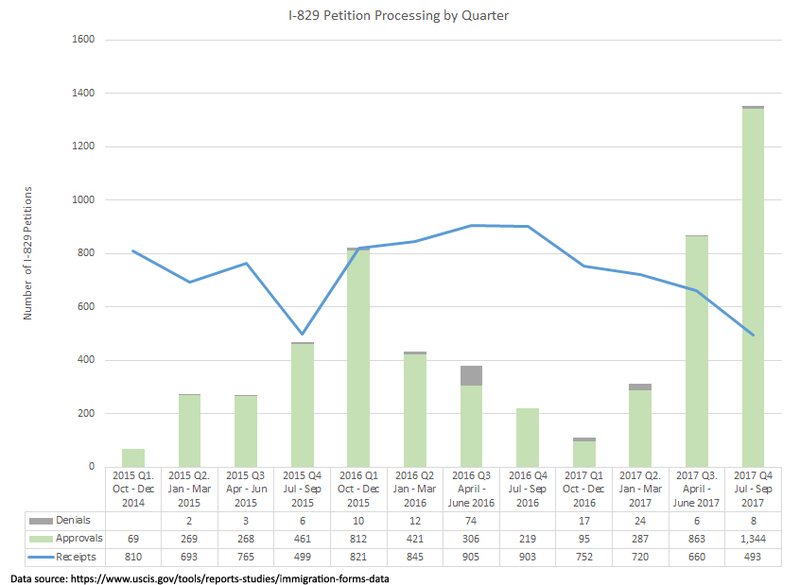 I-526 processing has improved year-over-year, but not consistently by quarter. IPO staff met with EB-5 stakeholders twice this week, at an official Stakeholder Engagement on November 7 and at an EB-5 Conference hosted by Baruch College on November 10. I’ve uploaded voice recordings of both presentations (11/7 here and 11/10 here), and you can watch the Baruch College presentation on YouTube here (IPO speaks in Part 6). Official remarks from the 11/7 engagement are posted on the invitation page. Hot topics included petition processing, Form I-924A, redeployment, bridge financing, and material change. I summarize a few highlights below. At the 11/10 conference, IPO Senior Advisor for Economics Jan Lyons provided a basic yet substantive introduction to the EB-5 program and how it works. Agents and potential investors, this is an excellent source of reliable information straight from USCIS. He speaks near the beginning of the Conference presentation Part 6. On 11/7, IPO Deputy Chief Julia Harrison generously spoke at length about processing issues, including staff allocation and petition workflow. Here’s my best effort to summarize the content （with time references to the 11/7 recording FYI）. Petition adjudication at IPO is divided across several teams, including a team handling I-829 and customer service, a team handling direct EB-5 I-526, and a group of teams handling regional center I-526. I-924 is also a separate workflow. Each team is staffed by adjudicators and economists. IPO is working to increase capacity by cross-training personnel. Previously, adjudicators and economists had specialist roles, with economists reviewing project-related documents for I-526 and economic issues at I-829, while adjudicators looked at source of funds at I-526 and sustainment at I-829. Now economists and adjudicators are each being trained to handle a single petition from start to finish. The I-829 team is now fully-cross trained, and performing well. One of the I-526 teams is already cross-trained, and the effort will continue until all officers can individually handle any part of I-526 petition review. Ms. Harrison anticipates that this new approach will increase capacity, promote flexibility, and help IPO more nearly reach the goal of processing petitions in first-come-first-serve order. Ms. Harrison points to posted processing times as the best estimate for when petitions filed in 2015 will be adjudicated. (26:22) She also noted that completion rate improvement in the past few months is not yet reflected in the Processing Times report. I-829 adjudications are making significant progress. Julia Harrison noted that the posted processing times don’t fully reflect the improvement yet, but she’s seeing much improved completion rates. In the 11/10 presentation, IPO Senior Advisor for Economics Jan Lyons pointed out that IPO has finally cleared a huge hurdle – the surge of applications and petitions filed in advance of the December 2015 sunset date. That surge slowed down processing not only due to volume but to the poor quality of many petitions, apparently filed in a rush. I-526 and I-924 adjudications are proceeding more quickly and smoothly going forward. Mr. Lyons pointed out three factors that affect an individual’s processing time: place in the queue, the qualify of petitions before yours, and the quality of your petition. Julia Harrison reports having no information to indicate that the April 2018 target date for finalizing the EB-5 regulations will not be met, though this does not depend on IPO. Her team is “always working” on the Policy Manual, but doesn’t have specifics on future updates. Lori McKenzie is no longer the Policy Division Chief, and Ms. Harrison did not mention a replacement. The EB-5 Conference with USCIS IPO, Hosted by the Steven L. Newman Real Estate Institute – Baruch College (November 10, 2017) had a number of solid presentations besides the IPO panel. Here is the list of speakers, and video of the panels. We heard some updated EB-5 numbers this week from Charles Oppenheim, the Chief of the Immigrant Visa Control and Reporting within the U.S. Department of State. Bernard Wolfsdorf gives highlights from the presentation in 5 Things I Learned from Charlie Oppenheim at the IIUSA 7th Annual EB-5 Industry Forum. The major news is Mr. Oppenheim’s prediction that Vietnam will have enough demand to be subject to a cut-off date in 2018, and India may need a cut-off date by 2020. Cut-off dates happen when a visa category is oversubscribed and a country demands more than its rightful 7% of available visas in that category. A cut-off date holds back applicants from oversubscribed countries long enough to let any other applicants from undersubscribed countries get first chance at available visa numbers. China is so far over the limit that it’s in an indefinite cut-off date situation with slow forward movement. Vietnam and India are just barely approaching the limit, and don’t have that much competition from other countries, so their cut-off dates would likely be temporary and hardly perceptible unless demand explodes. Since the IPO Processing Times report indicates that USCIS has only gotten to processing I-526 filed in November 2015, one wouldn’t expect to see applicants with 2016 and 2017 priority dates already in the visa queue. But Department of State reports nearly 2,000 applicants from the top five countries with priority dates after 2015, which means that USCIS must have processed over 600 petitions out of date order. Of course the number of pending visa applicants with priority dates 2015-2017 is still very small compared with the number of I-526 receipts in those years, so a majority of petitioners are getting held up in slow I-526 processing. I am surprised at the number of applicants with early priority dates still pending at NVC, considering that the China cut-off date progressed to mid-2014 this year (per the Visa Bulletin) and the other countries don’t have a cut-off date. 12/11/2017 UPDATE: The Department of State has provided updated numbers for pending visas in its Annual Report of Immigrant Visa Applicants in the Family-sponsored and Employment-based preferences Registered at the National Visa Center as of November 1, 2017. Here are updated charts based on the new data. Industry discussion about potential legislation has focused on the House-Judiciary Chair EB-5 Reform Proposal, a one-page term sheet with notes for potential future legislation. The term sheet proposes replacing the current Targeted Employment Area (TEA) system with a R/UD system. R/UD stands for Rural or Urban Distressed – two areas that would be incentivized for EB-5 investment with a slightly lower investment amount and fees, reduced job creation requirement, and – most potent of all – set-aside visas. A couple major questions to consider: which projects would qualify for incentives under the R/UD proposal, and who’d be the winners and losers, were the term sheet to become legislation and then law? To judge winners and losers, we look at proposed incentives for R/UD investment. The term sheet suggests that investments in R/UD areas would be incentivized in these ways: 1,500 annual set-aside visas each for R and UD (with any unused visas rolling over from year to year in the same category), $925,000 minimum investment, reduced job creation requirement (5 indirect), option for exemplar somewhat-premium processing (one year), and exemption from an extra visa fee. Investments outside R/UD areas would have a $1,025,000 minimum investment, compete for the 6,940 annual visas remaining after set-asides, and would be subject to a visa fee of $50,000. The R/UD definitions and visa set-asides would become available on the date of enactment, affecting everyone with a visa pending at that time. The term sheet specifies that people with pending petitions and applications wouldn’t need to increase their investment amount, but they would find themselves in a line suddenly made about 40% longer by set-asides that reduce the generally available visa pool. The term sheet offers this limited relief: “For 1 year after DOE, any unused set-aside visas may be used by investors who had filed petitions pending as of DOE that meet the new definitions of R/UD.” However, I guess that few pending petitions fall in that category. This means that the #1 loser in this proposal is the past investor still waiting on conditional permanent residence. Congressional staffers don’t cry over the past investor, because they’re annoyed by the filing surges that happened in recent years (while they failed to act) and have wanted retroactivity. Self-interested RC lobbyists may also have few tears for past investors, whose money is in the bank and whose presence in the backlog represents the major drag on recruitment of new investors. A small negotiating table could see a win-win in a proposal that could discourage past applicants into clearing out the backlog and smooth the way for new rural/urban distressed investment (effectively incentivized with set-asides) and new prosperous urban investment (still competitive thanks to minor investment amount difference). Industry players who care about past investors and clients exist, and I hope their concern will signify.